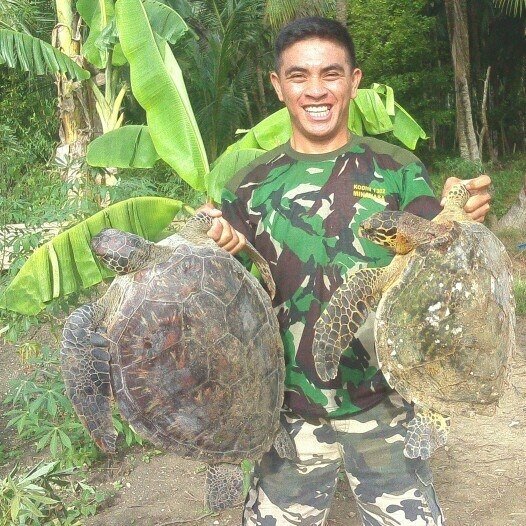 Protection of Forest & Fauna (PROFAUNA) Indonesia urges the authority to take firm actions against a Facebook user named Van Watung, who posted a photo of himself carrying two dead sea turtles and wrote on the caption that the turtles were to be eaten. It is currently suspected that the photo posted on 30 January 2017 was taken around South Halmahera, North Maluku. In his Facebook account, this 'Van Watung' person often wear military suits very similar to those of Indonesian Army. PROFAUNA North Maluku Representatives's initial investigation revealed that the suspect lives in Manado, North Sulawesi. "PROFAUNA strongly censures this act of sea turtle killing, let alone it is done by a military personnel. It is totally ironic and shameful," claimed Ekawaty Ka'aba, the coordinator of PROFAUNA North Maluku Representatives. PROFAUNA has filed an official record to the local Nature Conservation Agency, and is expecting a fast response for this case because all sea turtle species is protected as mentioned in Law no.5 of 1990 Concerning the Conservation of Living Natural Resource and Its Ecosystem. The regulation also states that protected wildlife species are forbidden to be captured, killed, and traded. Violators are liable to 5 years of prison and IDR 100 million fines. "From our investigation, we figured that the suspect has left Ternate on a ferry boat and now he is back in Manado. PROFAUNA is coordinating with fellow conservation activists in North Sulawesi to advocate this case," added Eka. The persisting wildlife smuggling from Ternate to other regions through sea transport motivated PROFAUNA North Maluku Representatives to bring together PT ASDP Indonesia Ferry and the Nature Conservation Agency to solve this issue. "PROFAUNA plans to immediately conduct a dialogue on wildlife protection with PT ASDP and also the National Armed Forces, because these institutions play vital role in preventing future wildlife smuggling attempts," concluded Eka.